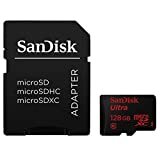 Amazon has the SanDisk Ultra 128GB uhs-I/class 10 micro sdxc Memory Card Up To 48MB/s With Adapter- sdsdquan-128G-G4A [newest version] for $69 with free shipping. Sells for $99+ Highest Price. Deals for $59 Lowest Price. Normally $86+.